Through seven and a half years, in addition to all else demanding his attention, L. Ron Hubbard had delivered more than 1,000 Advanced Clinical Courses and Professional Course lectures—a body of technology delineating every conceivable aspect of the mind and spirit and mapping the route to higher states. And now he embarked on the task of overcoming the only remaining barrier: cracking the toughest of “tough” cases. Convened immediately following the South African Anatomy Congress, the 3rd South African ACC is where Mr. Hubbard taught the Pre-Havingness Scale, a new assessment scale oriented around the make‑break point of a case. Trained on processes utilizing this scale, ACC auditors made short work of the “toughest” of those “tough” cases, cracking every one in four weeks. Yet all of this culminated in a development that, in his words, “made history”—Goals and Goals Assessment. For not only did the technology L. Ron Hubbard taught on this last ACC launch an avalanche straight to Clear, but SOP Goals led directly to an entirely new and pivotal echelon of auditor training—the commencement of the legendary Saint Hill Special Briefing Course and the final accomplishment of The Bridge we have today. What we have learned in the past more aptly fits in the future. The development of Dianetics and Scientology has if anything been backwards. It went from a medium high to a very high and then started downscale trying to find the undercut and where people lived. Well, we’re there now, we’ve got the undercuts and we know where people live. Well, just remember that the remainder of it has all been developed in the past and that you have it already. So don’t lose the old data and say, ‘Well, Ron changed his mind all the time.’ No, Ron has just been seeking new lows and we’ve got it now. In seven and a half years, in addition to all else that demanded his attention in terms of administration and expansion, L. Ron Hubbard had delivered 22 ACCs, giving a total of 931 lectures delineating every conceivable aspect of the mind and spirit and mapping the route to higher states. If the achievement inspires awe for its unprecedented scope, of even greater significance is what those lectures represent—a body of technology that will stand forever as a gateway to freedom for all beings on Earth, in this and every succeeding generation. And now, starting on 23 January 1961, Mr. Hubbard would teach the 3rd South African Advanced Clinical Course in Johannesburg. This first and only ACC he delivered in South Africa was also the last ACC he ever delivered. For it not only put the finishing touches and concluding exclamation mark on one entire phase of research and development, it marked the watershed starting point for the next. The back story of how he came to South Africa is the culmination of all he had sought to achieve since he launched the first Advanced Clinical Course in October 1953. Specifically, auditing technology to move any case up to Clear, and training procedures to make all auditors capable of accomplishing that goal with any preclear. With the breakthrough of Presessioning and the Regimens (1st Saint Hill ACC), combined with Model Session and a new standard of auditing procedure (22nd American ACC), HGCs throughout the world were now advancing cases to Clear regularly and with velocity. At which point, as Mr. Hubbard was to relate, came the realization that it was cases initially cracked that was the remaining obstacle in the drive toward broad clearing. “It’s a very dangerous thing for an incomplete body of knowledge to be extant. And that means that you can’t leave out one case here and one case there and say, ‘Well, we’re getting the percentage of cases and that’s all fine.’ No, that’s not good enough. That’s not even half good enough. That’s a very poor thing. You leave out one case and you’ve caved in the ruddy lot. So that’s what I’ve been going toward. 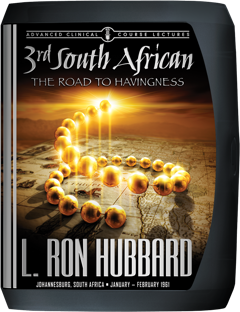 Yet a razor sharp HGC was only the start of what L. Ron Hubbard brought to South Africa. With word of mouth spreading like a bush fire, he convened the South African Anatomy Congress before 500 Scientologists—the largest Congress to date—where he announced a program to make every man, woman and child in the nation as able as possible, as fast as possible. Creativeness—what the bank has to do with it, and how auditing uninhibits the creativeness of the individual. And all culminating in yet another development, one that, in his own words, “made history”—Goals and Goals Assessment. In point of fact, what it meant for cases was so monumental he would direct all staff around the world to be audited on SOP Goals, regardless of all former auditing—quite simply because it was now the fastest route to Clear. And what that heralded was an entirely new echelon of auditor training—the commencement of the legendary Saint Hill Special Briefing Course and the final accomplishment of The Bridge we have today.